We are anglers through and through. Fly fishing is what we live for. Bozeman, Montana is our home base for a reason. There are more miles of blue ribbon trout water within a 2 hour drive than anyone could fish in a lifetime. Great public access means it is something everyone can take part in. 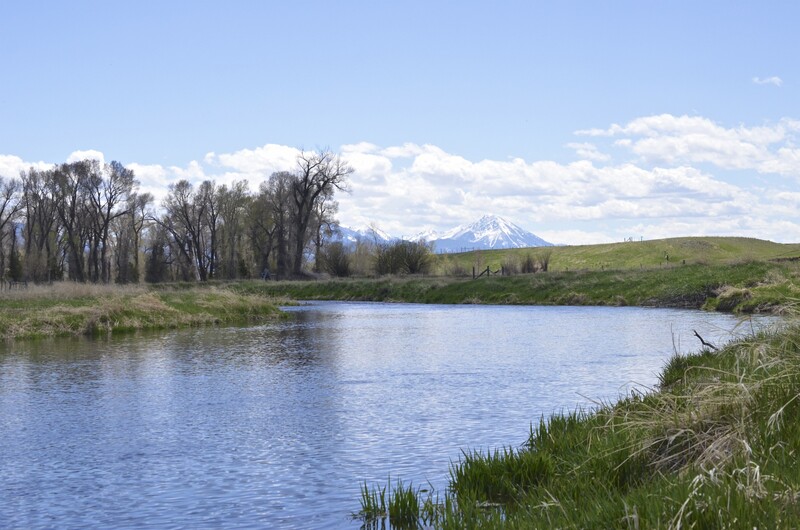 Big rivers like the Yellowstone, Madison, Gallatin, and Missouri make for exciting world-class fly fishing, and smaller no-name streams provide great angling opportunities for anglers looking for a more adventurous experience. Need a guide? Contact the Montana Angling Company today. Found yourself in Bozeman mid-winter and looking for something to do? Wondering what to do with all of the snow. Go ski it! Bozeman, MT has two world-class ski areas close by. Bridger Bowl is the smaller, local hill, just a short 16 miles from Main Street and home to some of the best snow on earth, ski the cold smoke! Skiers looking for more amenities look no further than an hour south of town to Big Sky Ski Resort. Big Sky is big. 5800 acres and 4350 vertical feet big to be exact. The tram ride alone on a clear day is worth the price of admission. And don’t miss Milkie’s Bar for après ski! Montana claims the most micro-breweries per capita. Bozeman is home to a bunch of great ones. Try and visit them all. Some have food, some are big, some are small, but all of them have good beer. And we like good beer. Each brewery has its own charm and craft beer specialties. All are family friendly. Root beer and non-alcoholic alternatives available at most for the kiddos. Support a local business and enjoy good beer while doing it. Just drink up before 8 o’clock. The classic Bozeman hike. Just north of town there is a big letter “M” constructed at the south end of the Bridger Range. There is a trail suitable for the whole family that goes up to it. Nice views along the way up. Great view at the top. Some people hike and ski it in the Winter. We stick to hiking it in the summer. About an hour round trip with a stop at the top to enjoy the view. Dog friendly! Year-round fun for the whole family. Chico Hot Springs is located an hour east of Bozeman in Paradise Valley at the foot of the Absaroka Mountain Range. The water from these natural hot springs is collected into two pools for visitors to enjoy. Expect a lively crowd year-round. While close to Bozeman and an easy day trip, their great dining room, bar, and resort means you can stay there for the night as well. Just be sure to book lodging well in advanced. There’s no better way to relax and rest up after a long day of fishing, skiing, or hiking than a long soak in the Chico Hot Springs pool. Running just west of town through the scenic Gallatin canyon is the Gallatin River. Rafting the Gallatin River is a great way to beat the summer heat and have fun doing it. The cold clear water rushes through the canyon and plenty of whitewater make for a fun-filled day of rafting. Wildlife viewing adds to the excitement with bald eagles, osprey, big horn sheep, elk, moose, and bears all possibilities to be spotted. While expert rowing is mandatory for the do-it-yourself adventurer, there are great commercial guiding services that make this popular adventure fun and safe for everyone. Every Tuesday from 5-8, June thru September, there is a great Farmer’s Market at Bogert Park in central Bozeman. Local produce, art, music, and vendors all show up and make for a fun activity the whole family can enjoy. This is a fun weekly to-do for many local Bozemanites and a great way to support the local farming community. Parking can be scarce, consider walking if you are already nearby. Visit www.bogertfarmersmarket.org/ to learn more. Montana is dinosaur fossil country and the Museum of the Rockies has the best display around. The Siebel dinosaur complex is a can’t miss experience. The T-Rex fossils are sure to amaze. The Taylor planetarium is a unique experience. Price of admission is reasonable. Fun for the whole family. Too rainy to enjoy Montana’s outdoors? Head to the Museum of the Rockies. Visit www.museumoftherockies.org to learn more. Lewis and Clark Caverns State Park is Montana's first and best-known state park featuring one of the most decorated limestone caverns in the Northwest. Naturally air conditioned, these spectacular caves lined with stalactites, stalagmites, columns, and helictites are electrically lighted and safe to visit. Above ground, a self-guided nature trail provides opportunities to understand the natural surroundings. Guided tours are available May-Septmeber. Visit www.stateparks.mt.gov/lewis-and-clark-caverns/ to learn more. Interested in Guided Fly Fishing? Contact Us Today.